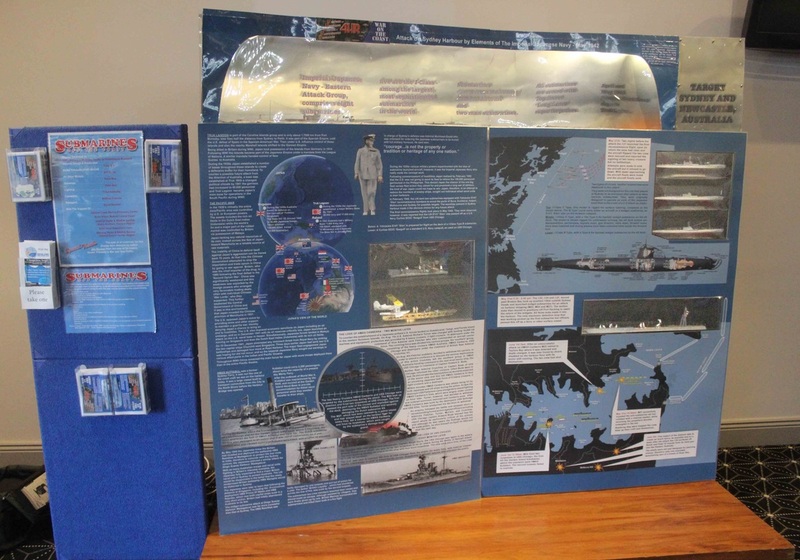 Over the past 5 years 4HR has researched and produced award winning graphics on the history of the BrokenBay / Hawkesbury / Gosford / Brisbane Water / Lake Macquarie areas. Some projects have received some grant funding, however, short falls in grant funding, other projects and this website are personally financed. In December 2016, operating as AREA History Tours, unique, budget priced history ferry tours were commenced by 4HR. A portion of the fares from each tour comes to AREA History Tours and a good portion of that goes into 4HR projects and maintaining this website. ‘History & Heritage, Hunter to Hawkesbury Research’ Group (4HResearch or 4HR) made this their priority project because of the financial support from author Jim Macken. Jim provided most of the last copies of his two history books, 'Pittwater's War' and the 'The Iron Coffin' for sale, with all the proceeds going to purchase materials to complete the project. The submarine subject is one Jim has undertaken a good deal of research into, he has also provided 4HR with access to all his research material. Two panels, which incorporates scale models and one large diorama are virtually completed, apart from a few small details required on a few of the models. Further panels are planned for this exhibition, dealing with the aftermath of the attack including the submarine sitings in Broken Bay and Hawkesbury River. Through the sale of two of his history book publications, Jim Macken's generous support has allowed the purchase of materials to complete this project. 1:72 scale Curtiss Seagull. As was seen on the USS Chicago, during the reconnaissance flight of the IJN Yokosuka E14Y mono plane over Sydney, the sightings were passed off as a Seagull from Chicago. The model aircraft is essentially plastic with additional detail including wing and float bracing. The aircrew and sailors are resin cast. The catapult is made from brass and pewter and still requires painting. The current exhibition consists of two wood frame panels each displaying a 1.4m x 700mm printed sheet. The printed sheets present specially prepared information, maps, illustrations, photos etc. Inserted into the timber frames and printed sheets are appropriate scale models with perspex windows, for protection. 1:350 scale IJN B1- type submarine with an E14Y reconnaissance/bomber on the forecastle. Detail is required, e.g. anchors, some brass detail, painting. 1:350 scale - IJN C1-type Submarine with Type A Ko-hyoteki-class submarine. 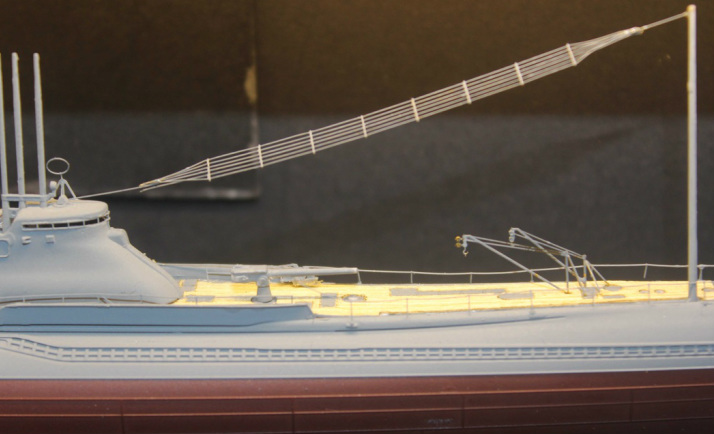 This model is rigged for surface running, it has radio aerial fitted, some detail is required like anchors and the midget requires painting. Detail of Type A Ko-hyoteki-class submarine on the aft deckof a C1-type Submarine. The cradle is brass and has been painted.The ‘midget’ and it’s hold downs require final attention and painting.The doors and ladder on the ‘Mother Sub’s’ conning tower are brass, as are all the hand rails. A Diorama, depicting the IJN submarines in Truk Lagoon prior to departure to the NSW Central Coast and then on to attack Sydney. 3 x 1:350 scale ‘mother’ submarines. 1 x 1:72 scale Ko-hyoteki midget submarine. 1 x 1:72 scale Japanese E14Y recon./bomber. 1 x 1:72 scale USN Seagull on a catapult as used on USS Chicago. 5 x different scale waterline models for the diorama. 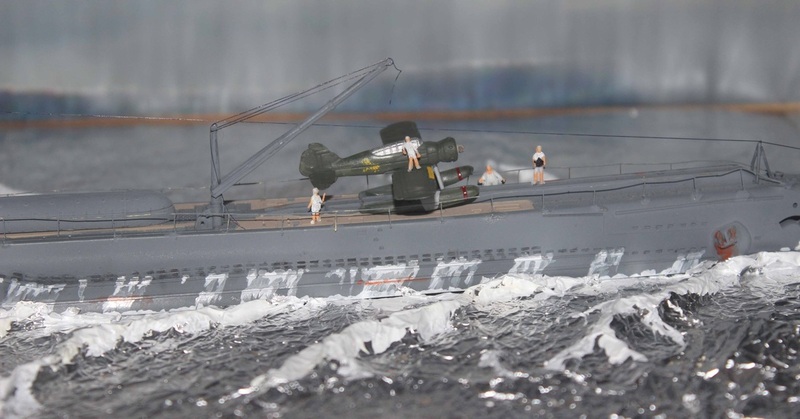 Detail from the main diorama’s 1:200 scale B1-type submarine with an E14Y reconnaissance/bomber on the forecastle. Hook on the deck crane requires fixing and the hand rail adjusting. 1:350 scale B1-type submarine with E14Y recon./bomber aircraft and a Ko-hyoteki midget submarine on deck. 1:72 scale Yokosuka E14Y aircraft on a section of scratch built submarine deck. 1:72 scale Ko-hyoteki midget submarine on a section of scratch built submarine deck. 1:2000 scale C1-type submarine, waterline model for The Diorama.1:350 scale C1-type submarine with Ko-hyoteki midget submarine on the deck. 1:350 scale B1-type submarine with Ko-hyoteki midget submarine on the deck. 1:700 scale C1-type submarine with Ko-hyoteki midget submarine on the deck. 1:1200 scale B1-type submarine, this small scale model is of cardboard construction and will require updating. 2 x 1:350 scale C1-type with Ko-hyoteki midget on deck. One is a waterline model. 1 x 1:350 scale B1-type submarine. 1 x 1:200 scale waterline model C1-type submarine. 1:350 RAN Collins Class Submarine which will be presented in the next stage. Type C1 submarine. Detail radio aerial & conning tower. The real submarines had wood planked decks constructed on top of the pressure hulls. The decks of all the 1:350 scale model submarines are made of real wood. 1:72 scale depiction of the screen of Maitland/Broken Bays with the submarine crew preparing a type A Ko-hyoteki-class submarine for release prior to the Sydney attack. Since this diorama was completed further research has revealed the ‘midget’ is facing the wrong way. This will be remedied in due time.